You can't deny that Robert Rodriguez is a hard worker. Having already released Sin City earlier in the year, we now have another of his family films. It seems a curious directorial existence, consciously bouncing from violent adult entertainment to light hearted kids films, but Rodriguez seems to have managed it so far. Then again, whereas the first two Spy Kids films did well both critically and financially, both the third in that series and his latest adventure, The Adventures of SharkBoy and LavaGirl in 3D have met with far less critical acclaim and success. Somebody really needs to tell Rodriguez that 3D with green and red glasses wasn't the height of technology in the 1980's when they made Jaws 3D (amongst others) and in the age of IMAX, is a dismal way to experience movies. Mind you, SharkBoy and LavaGirl had plenty of its own problems outside of technical issues and that, unfortunately, extends to the disappointly bland score. Rodriguez seems to have two mandates for music: to write as much of the score himself as possible and where this isn't possible (i.e. on every occasion) to gather together a team of composers to contribute. Rather than the hoards putting their oar in on the Spy Kids flicks, the Sin City duo of John Debney and Graeme Revell re-team with Rodriguez here with the director supplying the main thematic material. Unfortunate his well of inspiration seems to be running rather dry. While he just about pulled it off (with help) on the Spy Kids scores and Sin City, where Debney and Revell put their more considerable skills into shaping the basic material into something often very engaging, the two main themes here are largely forgettable. There isn't even the pep of a full symphony orchestra belting them out as the entire score is synthesized. Worse, the samples aren't even especially good; fine enough for a mock up, but hardly of sufficient quality to pass muster on a feature film made in 2005. A few tracks feature a female vocalist, which adds a veneer of quality, but isn't sufficient on its own. As ever, Rodriguez throws in a couple of songs. Dream (x6) is performed by 'LavaBoy' and is a strange, but brief rock song - the kind that would probably be a miniature work of genius had it been penned by Danny Elfman, but Rodriguez's effort is just shrug inducing. The LaLa's is composed by an offspring of one of the Mirimax honchos, a Weinstein. Needless to say, it sounds like a child singing to itself and not really worth of album publication. 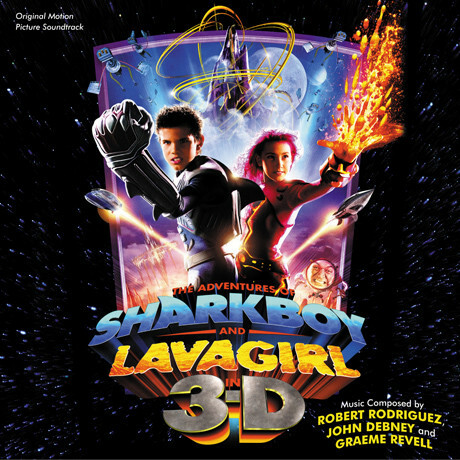 The album ends with SharkBoy and LavaGirl performed by The LavaGirls and it's not a bad rock song, although it sounds a bit too much like those featuring in the Spy Kids films, but not as good. John Debney and Graeme Revell are good enough composers to bring enough momentum and a little inspiration to their passages, but are hamstrung by the basic material provided and the non-acoustic performance. Disappointing, if only because the Spy Kids scores were such great fun and that SharkBoy and LavaGirl is just so non-descript, despite the evident good will poured into the score by its triumvirate of composers.